In 2011 the Noblis black box study on the accuracy of latent fingerprint comparisons was published. While the latent print community was relieved to see a large-scale study demonstrate the high accuracy of the identification decision, we were somewhat shocked to see a relatively high rate of erroneous exclusions. SWGFAST and other professional organizations have defined the exclusion decision as “sufficient features in disagreement”. 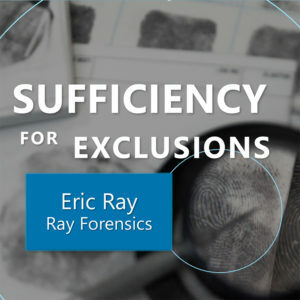 Although no specifics have been provided on how to define sufficiency, many agencies have defined their own standard for the exclusion decision. This lecture reviews recent research and proposes how accuracy study results can be applied to establish an exclusion sufficiency threshold and adjust comparison practices to reduce errors.